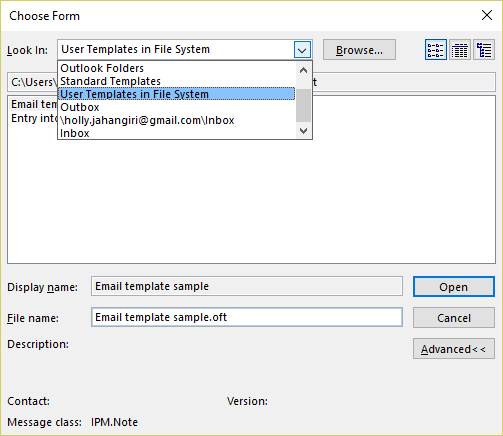 If you regularly send out emails containing “boilerplate” or information that rarely, if ever, changes, you can use Outlook email templates to simplify – and standardize – the process of creating them and sending them out to recipients. Email templates can help to ensure consistency of information, formatting, and other email options, such as delivery times and voting buttons. Using email templates can reduce the time it takes to send out a large number of emails, and come in handy when you don’t need to do a mass mailing but do want to reuse text and customize portions of it for different recipients. For example, if you are a member of a writing group, you may want to set up a template for emailing drafts for review. You could include voting buttons, such as Looks great! ;Needs work (see comments in reply). You could include links to your shared Dropbox account, or a reply link with a customized Subject line to make it easier to sort your inbox and find reviewers’ comments. You can add to the body of the email based on your template, or change any part of it before sending it out. In the New group, click New Email. If you have multiple accounts set up in Outlook, select the one you want to use as the From: address. Optional: Add additional recipients to the To: or CC: lines, if you want to include them every time you send an email using this template. Enter a Subject: or leave it blank. Enter the “boilerplate” content to use each time you create an email using this template. The body of the email can contain any constant text – including links – that you wish to include. In the Save As dialog, under Save as type, click Outlook Template. Select Have replies sent to and then, in the text box, enter the Reply-to email address (or addresses, separated by semicolons). Click the Options tab, as shown above. Click Do not deliver before and then enter a date and time. 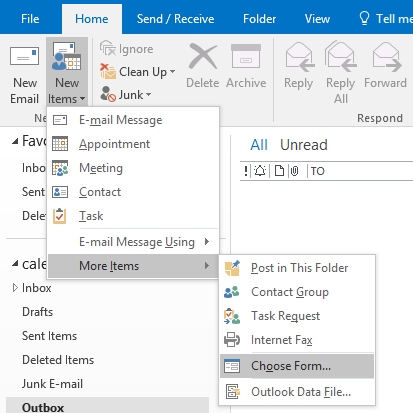 NOTE: If you are sending the email from a POP3 or IMAP account, Outlook must remain open until the message is sent or this will not work. Click Expires after to set a visual cue (strikethrough) in the recipient’s inbox that lets them know the email is no longer relevant. This is not the same as attempting to recall a message; it simply lets the recipient know that the message is outdated. NOTE: This doesn’t work reliably in all email readers (including mobile GMail and Email apps under Android). The default buttons – Approve;Reject – can be changed to any brief button text you want to use. Separate each button with a semicolon. Method 1: Find the .oft file and double-click it. Bold text should be typed exactly as shown. Italicized text must be customized with a valid email address and the text you want to use for the Subject line and the display text to click to send email. Outlook email templates are a convenient way to create customized, consistent, emails and send them out more quickly than using copy/paste or retyping important information each time.